How Does Your Weight Change in an Elevator? Inside an elevator you feel heavier, lighter, or normal depending on the motion of the elevator. In fact what you feel as your weight is your apparent weight, that is not always the same as your actual weight (or simply your weight). In this article you will find the definition of apparent weight and actual weight. Besides, then the motion of elevator and the change of your apparent weight inside it will be discussed. "M" is the mass of the object and "g" is the gravitational acceleration. But the weight that you feel is apparent weight, that is the normal force (or the support force) exerted on you by the surface that is in contact with you. This force is the reaction force of the force you exert upon the surface, and it is not always the same as gravitational force acting on you. For instance when you are in free fall, you do not exert any force on the surface that is in contact with you, so the normal force acting on you is zero, and you feel weightless. "T-Mg" is the net force acting on elevator, and "M" is the total mass of elevator. "A" is the acceleration rate of elevator. When the net force is positive, "a" is upward and vice versa. "N" is the apparent weight of passenger (the reading on the scale), and "mg" is actual weight of passenger. And the apparent weight of elevator is equal to "T". When elevator is standing still or moving with constant speed, "a" is zero and the apparent weight of passenger is equal to his/her actual weight. 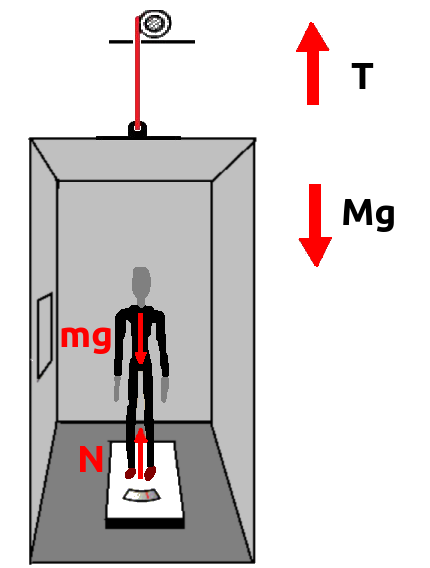 When the elevator is starting to move upward (from a lower floor to an upper floor), the initial net force acting on it must be upward (provided by increased tension on the cable, T>Mg). This initial net force provides an upward acceleration initially. So initial value of "a" is positive and the passenger feels heavier according to the Wapp.=m(g+a), and if he/she is carrying a bag it feels heavier too. After starting the upward motion, the net force acting on elevator is zero (T=Mg) and elevator continues its upward motion with a constant speed. So at this stage, "a" is zero and apparent weight of passenger is the same as his/her actual weight (he/she feels normal). When the elevator is going to stop at the upper floor, its speed decreases by a downward acceleration (provided by decreased tension on the cable, T<Mg); so at this stage "a" is negative and the apparent weight of passenger is smaller than his/her actual weight (the passenger feels lighter, and if he/she is carrying a bag, it feels lighter too). When the elevator is starting to move downward (from an upper floor to a lower floor), the initial net force acting on it must be downward (provided by decreased tension on the cable, T<Mg). This initial net force provides a downward acceleration initially. So initial value of "a" is negative and the passenger feels lighter according to the Wapp.=m(g+a), and if he/she is carrying a bag it feels lighter too. After starting the downward motion, the net force acting on elevator is zero (T=Mg) and elevator continues its downward motion with a constant speed. So at this stage, "a" is zero and apparent weight of passenger is the same as his/her actual weight (he/she feels normal). When the elevator is going to stop at the lower floor, its speed decreases by a upward acceleration (provided by increased tension on the cable, T>Mg); so "a" is positive and the apparent weight of passenger is larger than his/her actual weight (the passenger feels heavier, and if he/she is carrying a bag it feels heavier too).